To enjoy the benefits of advance notification, priority booking or even ticket discounts visit the About Us section on our website or call the Box Office on 0113 243 0808. Access Please visit our website for full details of our access provision or call 0113 243 0808 to discuss your requirements. Membership Secretary: Caroline Fields Email: cfields237@btinternet.com Tel: 0113 288 6393 / 07836 747730 Join In Our acclaimed Learning Programme invites children and young people to explore our historic venues. The thriving Youth Theatre, curriculumlinked schools workshops and training provision of placements and apprenticeships, enable young people from across the city to access the arts, get creative, build confidence and develop skills. For further information please visit the Join In section on our website. For full terms and conditions of sale please visit www.cityvarieties.co.uk/online/termsandconditions Unless stated otherwise, all ticket prices include a 60p Restoration Levy towards the preservation of this Grade II* Listed Building. Details correct at time of going to print. 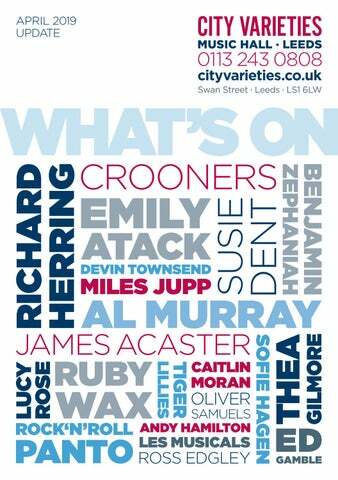 City Varieties reserves the right to make changes to the advertised programme. Jason’s new show promises to feature a wealth of new material about Jason growing up ‘working class’ then finding, over the years, that part of him has become ‘middle class’ – causing much confusion! Delivered with Jason’s amiable charm and captivating wit, this is a show not to be missed. Andrew Newton The Hypnotist Live! * Prices include £1 Booking Fee per ticket and 60p Restoration Levy. Postage charge £1 per order where applicable. In June 2018 Leeds’ leading musical comedian, Micky P Kerr, was rocketed to stardom when he won the hearts of the nation with his performances on Britain’s Got Talent. Time has passed and he’s now been brought safely back down to earth and back into his comfort zone as a Z-List celebrity. Presented by Avalon Productions Tickets from £16.60* VERY LIMITED AVAILABILITY FOR 8pm. Best remembered for portraying Mr Banks in Disney’s classic film Mary Poppins, David Tomlinson was renowned for playing the classic English gent, forthright, proper, and a loveable fool. The Life I Lead sees Miles Jupp – one of Britain’s leading comics and actors – bring David Tomlinson’s remarkable story to life. A richly comic and moving tale of fathers and sons across the generations. Gillian Anderson (X-Files, NT Live: A Streetcar Named Desire) and Lily James (Mamma Mia! Here We Go Again) lead in All About Eve, broadcast live from the West End in London. All About Eve tells the story of Margo Channing. Legend. True star of the theatre. The spotlight is hers, always has been. But now there’s Eve. Her biggest fan. Young, beautiful Eve. The golden girl, the girl next door. But you know all about Eve… don’t you…? The Totally Football Show checks in for a night of puns and punditry – but certainly not espionage – for its dirtiest live show ever. James Richardson, Producer Ben and their special guests will discuss whether this is finally the year Leeds make it back into the top flight or will their promotion push kick (Marcelo Bielsa’s blue) bucket? Something’s changing in Lucy Rose. After two albums of feeling her way through the densely-populated landscape of contemporary singersongwriter music she has picked a point in her career when most people are recycling their hits to bin the satnav, head off the map and commit to a graphically authentic version of her musical self. They’ll also check in on the Premier League, the Champions League and all the other goings on in the wide world of football. Sometimes you have to lose yourself to re-invent yourself. Alongside stories of mysterious forgotten words, you will hear Susie’s selection of the funniest moments from her 25 years on Countdown and 8 Out of 10 Cats Does Countdown, as well as some startling results from eavesdropping on a group of waiters. Mark’s sell-out show Who Do I Think I Am, revealed his natural father was a world backgammon champion. Now the star of Radio 4’s Mark Steel’s in Town and newspaper columnist of the year is touring a show which is guaranteed to make the world seem even more mental than it is. Susie will also include some of her favourite words from Leeds and beyond, plus she’ll be asking the audience for theirs and welcoming any questions about word origins, and the very future of our language in her very own ‘word surgery’. Devin Townsend is pleased to announce a very special European ‘An Evening With’ solo acoustic tour featuring Devin performing tracks from across his catalogue, as well as taking part in a Q&A. Legendary Status Quo lead singer Francis Rossi will share the extraordinary secrets of his 50+ years in rock ‘n’ roll when he takes to the stage for an intimate evening talking about his mishaps and adventures of life on the road. francisrossi.com Presented by A Way With Media Productions Tickets from £26.60* to £34.10* (VIP) VERY LIMITED AVAILABILITY * Prices include £1 Booking Fee per ticket and 60p Restoration Levy. Postage charge £1 per order where applicable. Join TV’s most experienced, highest ranking and most decorated SAS leader and sniper, Mark ‘Billy’ Billingham (as seen on Channel 4’s SAS Who Dares Wins), for an exciting evening of inspirational speaking and stories. Hosted and produced by Ultra Distance World Record Breaker and Author Mark Llewhellin. There will also be a Q&A and a chance to meet Billy himself. In an evening of reminiscence and revelation, Andy will look back over his 40 years in comedy and 60 (ish) years on the planet. You, the audience, get to ask the questions on any subject you may choose (apart from tofu, wellness, or Meghan Markle). Thea Gilmore releases Small World Turning on 17 May – her first new collection of songs since 2017’s The Counterweight which was her third successive top 40 album. She also embarks on a UK tour calling at Leeds with her band and support from Matt Owens (Noah And The Whale). Bubblewrap/Happy Fat Sofie comes to City Varieties with the show that won her the Edinburgh Fringe Best Newcomer award, Bubblewrap, all about self-acceptance and mental health. Plus, a first chance to hear her read from her new book Happy Fat, a manifesto for happiness and acceptance. Followed by a Q&A, it will be an evening of varied delights from one of the most exciting talents of recent years. The Grammy nominated Godfathers of Alternative Cabaret return with a very special show celebrating their 30th anniversary. Les Musicals live concert tour is the ultimate celebration of Musical Theatre. Jonathan Ansell (G4 frontman) and Jai McDowall (Britain’s Got Talent winner) have joined forces to create a dramatic and spine-tingling concert. This vocally dynamic evening showcases even more smash hit songs from the greatest musicals of all time, brought to you by two of the world’s finest voices. Count Arthur Strong Is Anybody Out There? After a sell-out appearance in March, Ed Gamble is back with another chance to catch his sensational latest show! An intimate evening with Danny and Luke They usually headline arenas and festivals. But this autumn, British rock band Thunder will celebrate their 30th anniversary with a series of up-close-and-personal shows for fans. Founding members singer Danny Bowes and guitarist Luke Morley will talking through the highs and lows of life in Britain’s most popular rock band. And they’ll punctuate their unscripted conversation with host Mick Wall by playing acoustic versions of fan favourites. The 16-date Unplugged & Unscripted tour will give fans the chance to see them as they’ve never been seen before. And the addition of a strictly limited number of VIP tickets will also provide followers with the chance to meet them before each show. Returning to City Varieties following the last sell-out performance, Austentatious is an improvised comedy play starring a cast of the country’s quickest comic performers. Every single show the cast conjures up a brand new ‘lost’ Jane Austen novel based on nothing more than a title suggested by the audience. World famous Hypnotist Andrew Newton returns by public demand for another evening of mischief and absurdity. If I’m Honest Join Ed as he takes a long hard look at himself and tries to decide if he has any traits that are worth passing on to his children. Having heralded his return with the song Permanent Way and a sold-out show at London’s Omeara, Charlie Cunningham marks the announcement of a headline UK/ European tour in October with the unveiling of a second new track Sink In… dusty, driving music mining that rich seam of Flamenco guitar that runs through much of his music. Following an amazing appearance last November, the unique Crooners returns to City Varieties. A brand new show with stunning sing-along songs! Returning with their ever-popular live show featuring all the big hits, including Under the Moon of Love, Three Steps to Heaven, Hey Rock & Roll, When, Blue Moon and Pretty Little Angel Eyes. The information contained in this brochure is correct at the time of printing. Whilst every effort is made to avoid programme changes, we reserve the right to make alterations, where necessary, without prior notice, if unavoidable. Tickets are sold by Leeds Grand Theatre & Opera House Ltd, Company Registration Number 00978161, Charity Registration Number 500408, 46 New Briggate, Leeds, LS1 6NZ, on behalf of producers, promoters and event organisers, as well as for our in-house productions. City Varieties Music Hall is very grateful for the generous financial support of The Friends of City Varietes, the family of Jimi Heselden (for auditorium sponsorship) and Emerald Group Publishing Ltd (for Green Room sponsorship).